BLAZER DE HUGO BOSS. Material: 100% LANA. Main Colour Grey. EAN Does not apply. Length Hip Length. Size Type Regular. Neckline Collared. Chest Size 54/44. Harris Tweed Blazer 42R. Wonderful Harris Tweed blazer in an amazing weave in a mix of dark grey and black to create a fantastic quality fabric (see close up photos). This blazer has black buttons, 2 flap pockets, 3 inside pockets and a sumptuous lining. Amazing Harris Tweed blazer in a superb quality tweed in a mix of grey's with windowpane detail in red and yellow to create a lovely fabric in fantastic condition (see close up pictures). Harris Tweed Blazer 40R. JACKET : Single breasted with button up front. 2 pockets front. It is fully lined in a brown coloured, very cool, 2 internal pocket. ideal for all occasions. Single vent at the back. CONDITION : This coat is used, but in Excellent conditio. Chest Size 152. Outer Shell Material 100% Wool. Country/Region of Manufacture Romania. Por lo tanto, si usted vacila en que su pedido puede faltar, se recomienda esperar una semana más antes de intentar obtener información sobre el tema de nosotros. Wonderful Burberry Blazer 42R. Beautiful lightweight tweed blazer from Burberry in a superb quality Donegal type weave fabric in a great mix of grey, white and black in 100% Virgin Wool. This blazer has 2 flap pockets, grey buttons and a luxurious black lining with the Burberry logo embossed throughout which finishes it perfectly. Wonderful Burberry Blazer 42L. Beautiful blazer from Burberry in a superb quality fabric in a wonderful charcoal grey colour in 100% finest Wool. This blazer has 2 flap pockets, horn style buttons and a luxurious black lining with the Burberry logo embossed throughout which finishes it perfectly. Harris Tweed Blazer 42R. This blazer has half canvassing to the front, grey horn style buttons, 2 flap pockets, 1 inside pocket and a grey lining. Details include: breast pocket, 3 buttons fastening, 2 flap pockets, 1 inside pocket and single vent. Wonderful Harris Tweed blazer in a great quality tweed weaved especially for Mario Barutti which is a mix of superb vibrant colours to create a beautiful soft fabric. Lovely Harris Tweed Blazer 42L. This blazer has rare black Harris Tweed orb buttons, 2 flap pockets, tweed edged inside pockets, nubuck leather collar underside a nd a luxurious iridescent brown lining with the Harris Tweed orb embossed throughout which finishes it off perfectly. Stunningly Beautiful Jacket from Paul Smith in PRISTINE CONDITION and size 42R. MARKS AND SPENCER. Great looking Navy colour, If you look up close it is made up of little squares of balack and blue but overall it gives the effect of a navy jacket. 100% Pure New Wool - but light weight not like the heavy wool. A fully lined Grey Wool Jacket from Gap. Fully lined. M&S Autograph Alfred Brown Grey Wool Blazer. 42” Chest, Regular Fit. Personal Cheque drawn on a UK bank. IS INCLUDED with International Signed For up to £50. IS NOT INCLUDED with UK Standard or International Standard. Brooks Brothers classic ivy League tweed sack jacket. Union made in USA. Superb Harris Tweed jacket by the highly regarded tailor 'Mario Barutti' in a speckled navy grey cloth. The jacket has a 2 button front, double vent rear, suede elbows and is fully lined. Harris Tweed embossed lining and buttons. Grey colour. Double breasted. Collar and lapel. Black lining with one internal pocket. Made from Wool in England. A truly wonderful overcoat. Dry cleaned and steam pressed before being listed. IN THIS INSTANCE A SIZE 42 SUIT WILL NEED A SIZE 44 OVERCOAT. Dark grey Crombie by Willerby of London. Two side pockets. No label to suggest size Armpit to armpit is 22 inches on outside of coat. Total length 40 inches Any questions, please ask. The lining is torn under one of the arms, see photo. See my other listings. I have other size coats. Any questions please ask. VGC,size L. Elvis Jesus. shell 70%wool,20%polyester,5%viscose,5%othe. lining 100% silk. Abrigo de lana estilo blazer de lujo de Peter Millar Myers. Color: aparece en la etiqueta como British Racing Green (es un gris verdoso). Estilo # MF13RZ31. Garantizo que todos mis artículos son 100% auténticos. Lovely Harris Tweed Blazer 42L. Authentic Harris Tweed is issued with the Harris Tweed Orb Mark after inspection by the Harris Tweed Authority, the industry's governing body. Harris Tweed blazer in a great quality tweed which is a mix of grey and black to create a beautiful fabric in superb condition. Length 30.5. Stunning condition looks Hardly worn. shoulder to arm cuff 25.5. Harris Tweed Blazer 48R. Wonderful Harris Tweed blazer in an amazing weave in a superb mix of grey's with black to create a fantastic quality fabric (see close up photos). This blazer has black buttons, 4 inside pockets and an amazing sumptuous black lining. Harris Tweed Blazer 48L. Harris Tweed blazer in a nice weave in a mix of grey's to create a fantastic quality fabric (see close up photos). This blazer has grey buttons, 2 flap pockets, 4 tweed edged inside pocket and a sumptuous grey lining. If I had to give this jacket a score on quality and price I would give it 10 out of 10 - This is a lovely item - luxury jacket - looks great - quality material - it looks elegant, stylish fashionable and is made from quality cloth. Harris Tweed Blazer 46L. This blazer has grey buttons, 2 flap pockets, 4 inside pockets and a sumptuous grey lining. Details include: breast pocket, 2 buttons fastening, 2 flap pockets, 4 inside pockets and no vent. Amazing quality coat from Issimo, Italy in a superb soft grey herringbone pattern in a luxurious 100% Wool fabric in great condition. Grey Italian Overcoat. The coat has 3 front buttons, 2 external flap pockets and a sumptuous lining. Pit to pit 2 1.5 shoulder 18 shoulder to arm cuff 2 5.5 length 3 3.5. This is a lovely hardly item - luxury blazer - looks great - quality material - elegant, stylish and fashionable - made from quality cloth. Beautiful grey luxury P/S blazer - looks in good condition for used designer. Bought from Selfridges a year ago and has since just been sitting in the cupboard with no use like many of my Tom Ford pieces. Length: 26. This is a really heavyweight coat with tasteful detailing throughout, and is of a very good quality as would be expected from Acne Studios. This coat is pre-owned, but in excellent condition. There are a good number of inside pockets, with 3 on the left hand side. Ch es t is 4 6”. Crombie Mens Vintage Dark Grey Wool Coat Sz 42-44 Reg Peaky Blinders Good pre owned condition Wool Heavy Gently used Sleeve 25 inches Length 40 inches Chest 44 inches Shoulder to shoulder 21 inches Happy to post internationally but please contact me for an accurate postage quote for your specific country. Postage quoted is an estimate. The jacket is in excellent condition. However in the area we cover there are more than 1300 children who may need our support, so there is much more to do. Colour grey with classic Burberry check inside. - Size XXL. - 100% English Wool. - Removable hood. Country Tweed Hunting Shooting Hacking Norfolk. Stylish Sports Jacket Blazer Coat. 100% Pure New Wool. With Faux Suede Elbow Patches. Grey, Brown, Blue & Red Houndstooth Check. Faux Suede Elbow Patches. Men’s Genuine Crombie Pure Wool Overcoat - Charcoal - 38” Classic. Underarm to underarm 22” Shoulder to shoulder 19” Back of neck to hem 25” Shoulder to cuff 45” The fabric on this coat is in immaculate condition except for a tiny tiny repair on the back (see pic) this is hardly noticeable and does not take anything away from this exquisitely made overcoat. From a smoke free home. LUIS FABRE OVERCOAT. SLEEVE LENGTH FROM SHOULDER IS 27 I NCHES - LONG. Lovely Harris Tweed Blazer 40L. Authentic Harris Tweed is issued with the Harris Tweed Orb Mark after inspection by the Harris Tweed Authority, the industry's governing body. Harris Tweed is protected by the Harris Tweed Act, which strictly outlines the conditions in which the cloth can genuinely be made. 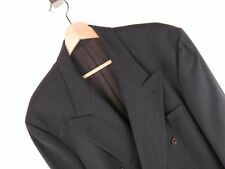 This is a lovely used item - luxury blazer - looks great - quality material - elegant, stylish and fashionable - made from quality cloth. We will point out everything we see in the photos. It could be many decades old. All the information you need will be in them. SIZE 50uk - 40R us. Elegant mid-weight Bertolucci Movie grey blazer for all seasons. It has the Derby county logo embroidered on the pocket flap. from the Hugo Boss. A comfort fit 'New Classic' line by Hugo Boss.